North Dakota’s early Canada goose season is set, and bag limits and licensing requirements are the same as last year. However, one major change from last year is that the state Game and Fish Department has restructured the Canada goose hunting zones. Migratory game bird management supervisor Mike Szymanski said the new structure addresses depredation issues and provides additional hunting opportunities. “Basically, our worst Canada goose-landowner conflicts are in the eastern half of the state and getting those extra days back in September gets some more harvest pressure on those birds,” Szymanski said. The Canada goose hunting season is divided into three zones – Missouri River, western and eastern. 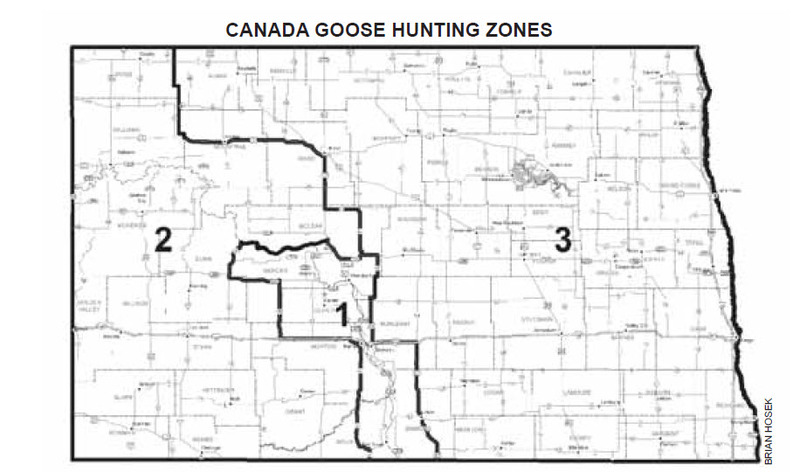 The Missouri River Canada goose zone has the same boundary as last year, while the western zone has the same boundary as the high plains duck unit, excluding the Missouri River zone. The eastern zone has the same boundary as the low plains duck unit. The early season opens on Aug. 15 in all three zones. Closing dates are Sept. 7 in the Missouri River zone, Sept. 15 in the western zone and Sept. 21 in the eastern zone. The early Canada goose season has a limit of 15 daily and 45 in possession. Limits and shooting hours for the early season are different from the regular season, while the zone boundaries will remain the same. Shooting hours during the early season are one-half hour before sunrise to sunset daily. Residents need a $5 early Canada goose license and a general game and habitat license. Also, residents age 16 and older need a small game license. Nonresidents need only a $50 early Canada goose license, and the license is valid statewide without counting against the 14-day regular season license. A federal duck stamp for hunters age 16 and older, and Harvest Information Program certification, are both required beginning Sept. 1. Those who HIP registered to hunt the spring light goose season in North Dakota do not have to register with HIP again, as it is required in each state only once per year. Waterfowl rest areas, closed to hunting during the regular season, are open during the early season. Most land in these rest areas is private, so hunters may need permission to hunt. The early hunting season is intended to reduce local Canada goose numbers. Despite liberalized regulations the past several years, with longer seasons, large bag limits and expanded shooting hours, the statewide population remains high, with numbers well above population goals. For additional information and regulations, hunters should refer to the Game and Fish Department website, gf.nd.gov.